The vision of Christian Black Belt Academies, International is to train people with practical and traditional techniques of self-defense while developing their moral and spiritual character. 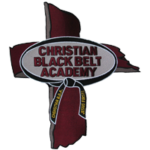 CBBA is a Christ-centered martial arts organization that believes in promoting integrity, courtesy, loyalty, respect, perseverance, honor and self-control in every student. The Purpose of Taekwondo is to prepare students for combat situations as the need for self-defense becomes evident. People in our society are protected by laws issued by governments for their protection. In times of trouble we rely on our military and our police to ensure our protection. The need for combat methods used in Taekwondo are not often required for our everyday safety. Therefore, in today’s society, Taekwondo is taught as a defensive art, which develops skills in self-protection, physical agility and mental awareness. We teach the christian approach to self defense, train the children how to non-violently deal with bullying, and other programs. This class teaches sparring, forms, board breaking, situational awareness, etc all through the Christian mindset. Picking the right program for self-defense in Brooklyn, Grinnell, or Newton can be overwhelming. Let us help you!